As they say, mirrors are the doors to the soul – well, in designing, mirrors allows your spaces to expand in width or in length, depending of course in the shape and style of the mirror that your designer or decorator suggested for your space or the on the one that you actually liked. 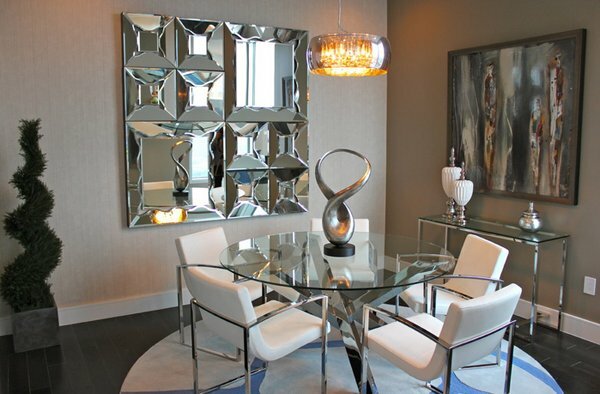 Before we have featured a list of dining rooms with mirrored furniture in them – for today, we will be showing you a list of dining rooms with mirrors as the main conversational piece. Some of the mirrors in this list are ordinary squares or rectangular, some on the other hand are burst mirrors or irregular ones – I am sure that you’d like most of the spaces here because of the unconventional touch they give to the spaces. The dining chairs are classic in structure, but made edgy with a patterned print on its back. The sea urchin-like chandelier and oversized Casamidy mirror complement the couple’s modern style. Barnes opened up the house to create a light-filled, functional environment. Replacing the dilapidated windows and doors with high European-style versions brought in more light, and antique Indian and Syrian mirrors with mother-of-pearl and bone reflect it around this open dining space. 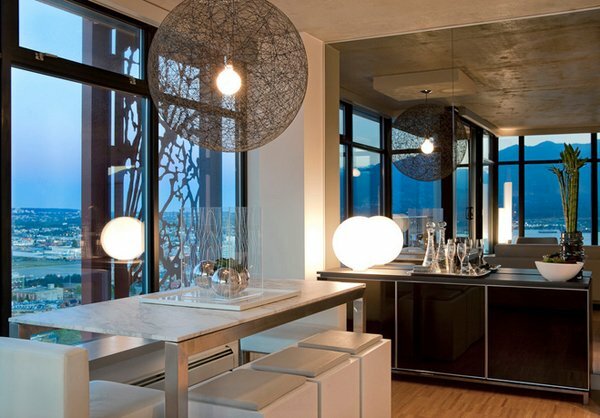 A mirrored wall can be a great way of achieving a dramatic effect – as well as giving the illusion of more space. Cover an entire wall or just the chimney breast or alcoves for a truly opulent feel. 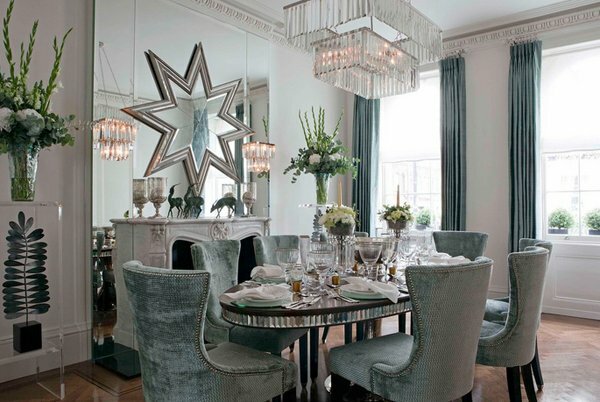 The addition of a star-shaped mirror on this chimney breast really adds a pow to this room. 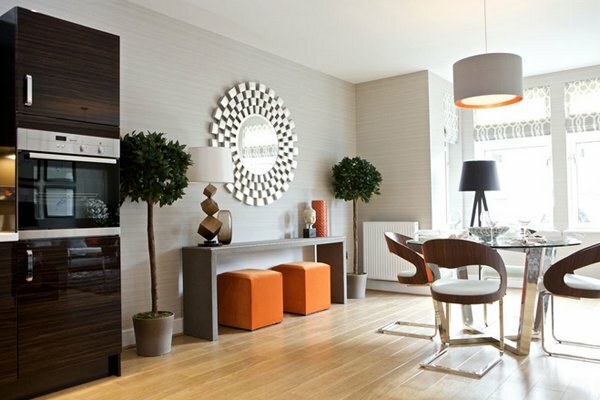 Image: Sublime Interior Design Ltd. Contemporary dining room set – simple yet luxurious, they can take a neutral room and spin it on its heel in an instant. 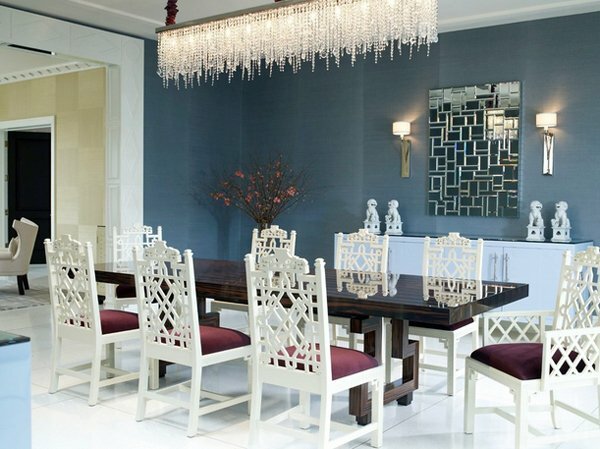 Stunning dining room with a custom Macassar dining table, custom buffet in a robin’s egg blue with an automotive finish, beautiful crystal chandelier, custom mirrors all faceted. 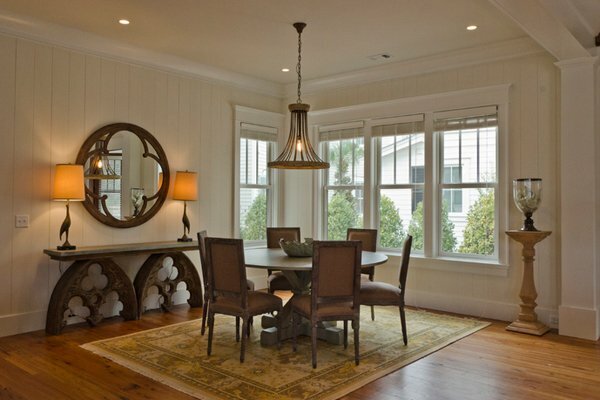 Increase light and views by placing a big mirror directly across from a window. Reflecting a beautiful view is ideal, but placing a mirror across from any window that gets good light will make your room feel sunnier. Nava’s client usually eats at one of the many restaurants in River Oaks, so the sculptural piece on the glass table isn’t distracting anyone in the dining room. The space is really an extension of the “cool, trendy, club-like atmosphere” that Nava’s client enjoys when out and about. 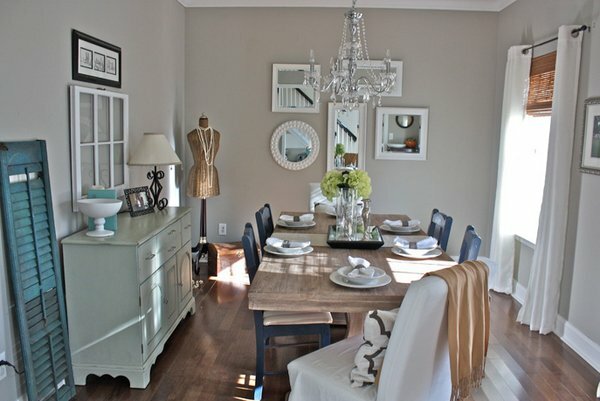 The glamorous mirror that is by the buffet is very interesting and vintage – goes well with the dining room set. Do you see the fun mirror decor by the glass window overlooking the pool? Pretty unusual and stunning right? According to the designer, this is the full view of the dining room in my high rise condo. The building has a concrete ceiling so the designer did a drop down soffit complete with LED lighting for ambiance. 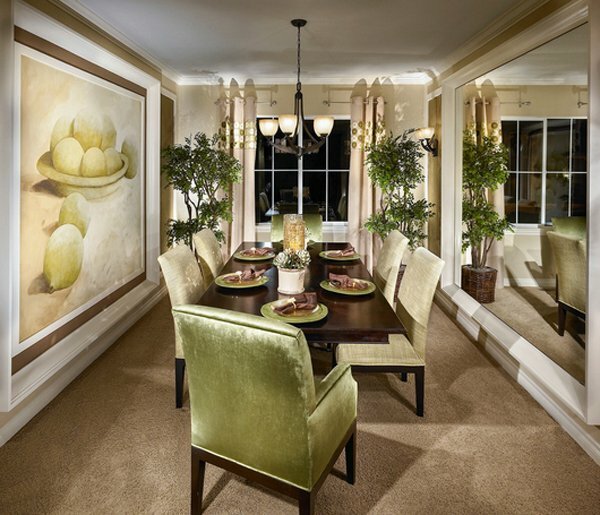 Adding a mirror in a space makes the room seem larger, I like the mirror in this dining room, but the frame does not really complement well with the color palette of the entire space. Never underestimate furnishings built for corners; they can become your space-saving best friends. In small dining rooms, consider a corner cabinet for your dishware collection. This leaves the walls open for other pieces, such as a large mirror to help further open the space. The chandelier in the middle of the room sure makes this room more elegant, but look at how stunning the mirror on the side is – it is just superb! 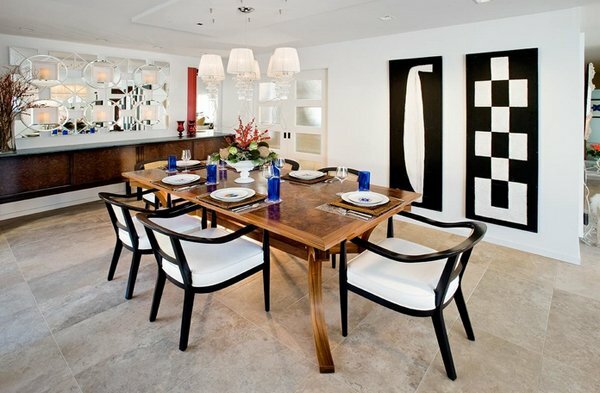 The mirrors and the wall sconces makes this dining space rather compelling – in a positive way. I like the absorbed feeling you get in this space. If space is at a premium in your dining room, consider a round table. This beautiful pedestal table leaves plenty of room at the other end for a buffet. 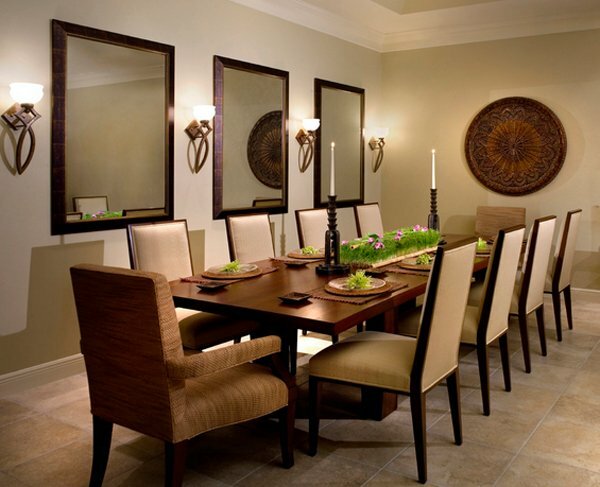 Here is one example of a simple dining room that has a simple and stunning mirror. Here a carefully placed mirror accentuates the symmetry of the furniture, also making the room appear more exciting than it is. Image: Lita Dirks & Co. 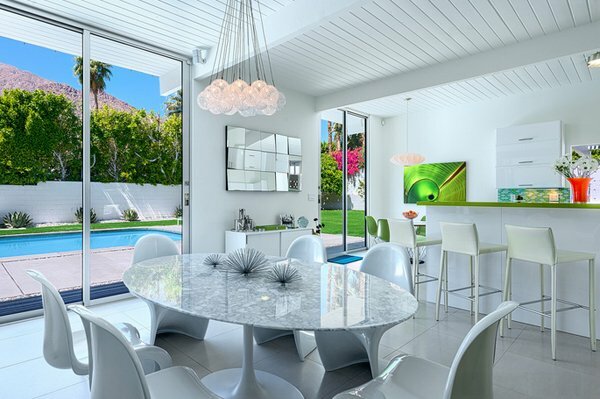 Image: Atmosphere Interior Design, Inc.
How did you find the mirrors and the dining rooms in this list? I personally love most of the spaces in this list because not only are they beautiful- but the mirrors are special in their own ways and believe it or not made a lot of difference because they are in the spaces – imagine the rooms without them, they’d look drab or ordinary. Well, that’s just me, haha! Check out and see how much options you have with mirrored furniture!